This is not so much a case of something I want to try, more something we ARE going to do. We are building a pizza oven. Yes we are. Starting this week. 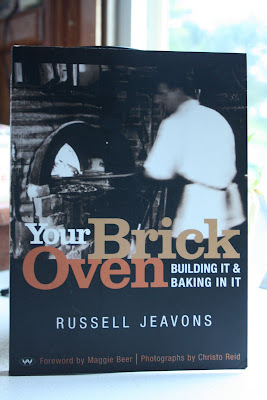 I've always wanted an outdoor brick oven and we've had Russell's book for years in anticipation. Now it's all systems go. Work is starting tomorrow. I'll keep you updated on how we fare. Have you ever made a brick oven? Any tips? Thanks to Cindy as ever, for hosting and to Melanie for this weeks theme. It's meant I've put the dream out out there, so now there's no turning back! Who's for a slice? I've never built a pizza oven, but have been to Russell's & eaten his fantastic pizza, so imagine his book would be a cracker, too. Good luck with your oven - how exciting! I am so..........jealous, I'm married to a bricklayer and currently begging, begging for a pizza oven. I'll keep working on him, I cannot wait to see your progress photos and the pizza results. I am sure it wont be unlike my wood combustion oven, that she may take a while to get to know but in the end you will love it!!! Oh how exciting! Love it. My parents almost bought a holiday house once purely on the basis that it had an outdoor brick oven! I wish they had done. Wonderful, that is a very exciting project. I can imagine many evenings where pizza is on the menu! oh love it!! we are doing a cobb oven in the back as well to go with our "beer garden" we have planned..hehe can't wait to see your progress! How exciting! So when can we all drop around for pizzas at your place...? Yes Michelle, Russell is King of the Pizza ovens, no doubt about it. The only tip I have is that it takes a while to get the heat regulation right with the burning logs. So maybe be prepared for some serious experimentation & keep your sense of humour! Very exciting, my sister in law is about to start building one and I've taken some photos of our friends oven here in Hobart...I'll send some through to you as well. Wow, an impressive endeavor! Can't wait to see the final product.